Darwinian evolution is taught unreservedly to students of science around the world as incontrovertible truth even though many aspects of the theory have been thoroughly discredited while others are woefully lacking in corroboration from a standpoint of proper scientific precept and practice. Practical and honest scientists increasingly are acknowledging that evolutionism is biologically and mathematically impossible. The outlandish premise is at odds with the laws of physics and manifestly incompatible with genuine geological and paleontological criteria for aging and classifying rocks, strata and fossils. Evolutionary theory's ostracism of a god as a supreme designer and creator of the universe and of life has emboldened many of history's most ruthless dictators who have embraced its disturbing message to commit crimes of unspeakable evil. Many millions of people have lost their lives as demagogues, fuele by evolutionist inclinations, have sought to legitimize sinister proclivities such as racism, bigotry, eugenics and ethnic cleansing, among other perpetrations of antipathy and wickedness. 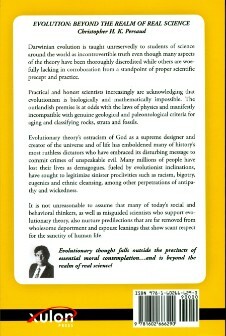 It is not unreasonable to assume that many of today's social and behavioral thinkers, as well as misguided scientists who support evolutionary theory, also nurture predilections that are far removed from wholesome deportment and espouse leanings that show scant respect for the sanctity of human life. Evolutionary thought falls outside the precincts of essential moral contemplation...and is beyond the realm of real science! 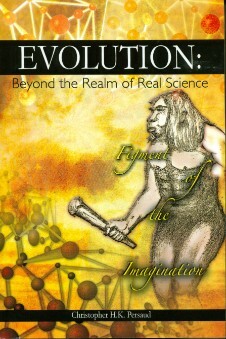 Visit www.barnesandnoble.com or www.amazon.com to order your copy of EVOLUTION:BEYOND THE REALM OF REAL SCIENCE. You may also order at your local bookstore.